One of my earliest memories I have from cooking is making boxed mac and cheese with my older sister. I still remember the pride of being able to create such cheesy goodness from a box (admittedly, we added a LOT of butter!). My cooking has thankfully gotten a little more advanced since then, and I have added a few more recipes to my culinary repertoire. I have also decided to start teaching my 6-year-old daughter, Elle, some basics in the kitchen. I always have so much fun cooking together with my family, and find it is a great learning experience for Elle. I let her measure and count, select ingredients, stir, and pour. I let her try to do anything that doesn’t involve sharp objects, heat, or other tasks that could be dangerous. She has so much fun, and I can see the pride she has when she gets to eat the food she helped prepare! I also think it is essential to teach her how to cook before she goes off to college. I want her to have a healthy love of real, home cooked meals, and teaching her how to make them is a great way to ensure she has the tools to do just that! In addition to helping in the kitchen, I have been exploring different types of cuisines so my kids are exposed to a wide variety of flavors. 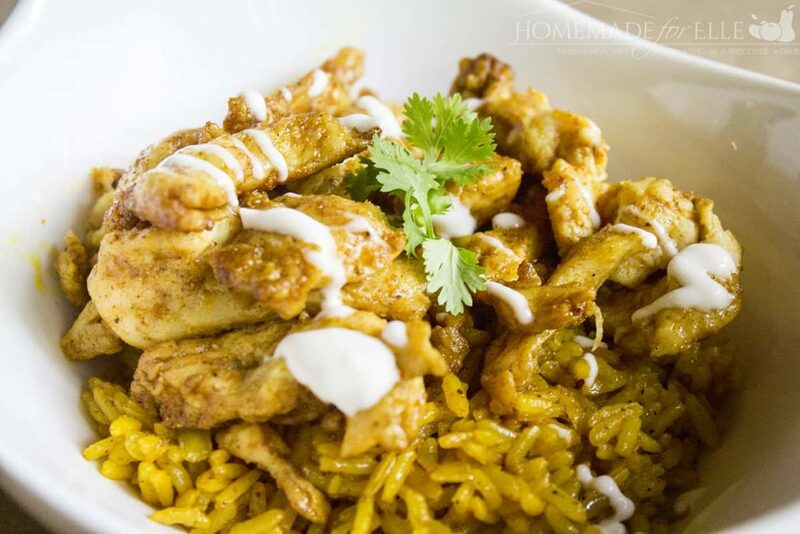 This past weekend, we decided to make some chicken shawarma and turmeric rice, which is a delicious Middle Eastern dish. 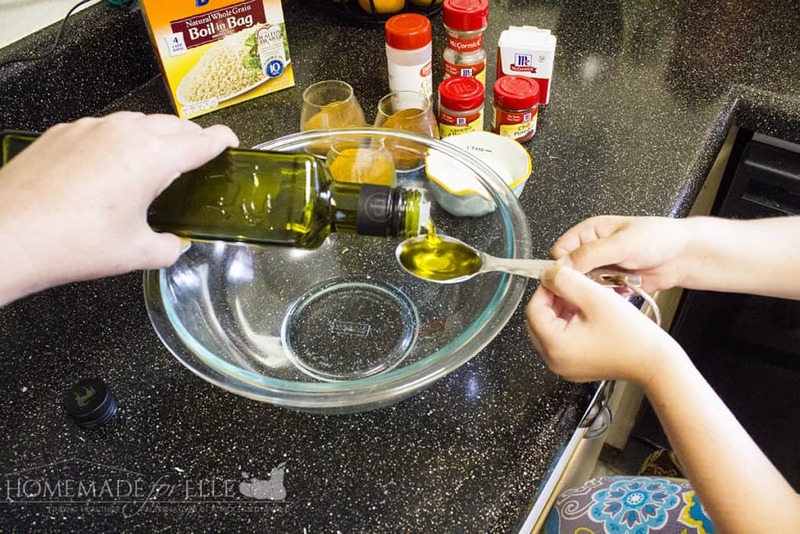 I started by having Elle measure out the olive oil and spices into a large bowl. I poured ingredients, while she held out the measuring containers and counted the number of teaspoons or tablespoons we needed for each ingredient. I also let her do the honors of adding salt to the marinade and stirring it. I sliced up the raw chicken and added it to the bowl, then set it in the fridge to marinate. 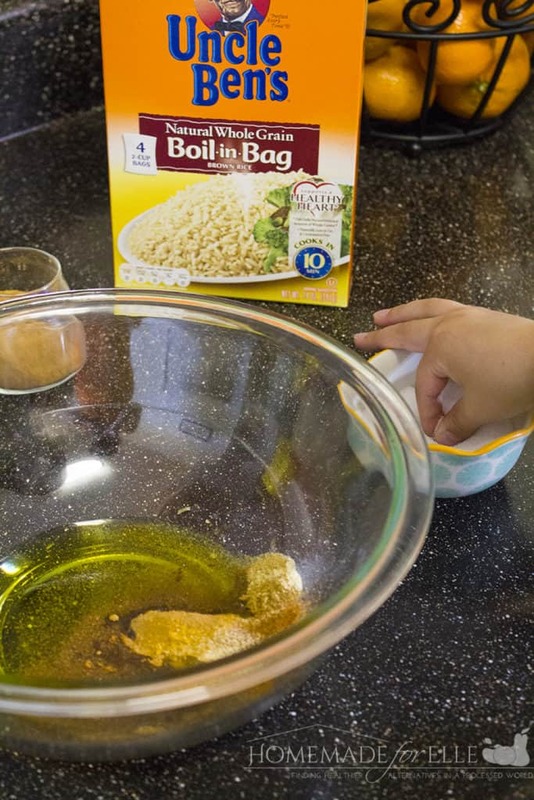 One of my favorite time savers in this dish is using Uncle Ben’s Natural Whole Grain Boil-in-Bag brown rice. Instead of taking 45 minutes to cook brown rice, we can have perfectly cooked whole grain rice in only 12 minutes! I boiled my Uncle Ben’s Whole Grain rice in chicken broth until soft, while the chicken was marinating. Once the rice was done, I drained the broth, emptied the rice back in the pan, added some butter, turmeric, salt and pepper. That was it for the turmeric rice recipe! Then I sautéed the chicken shawarma until it was cooked through. 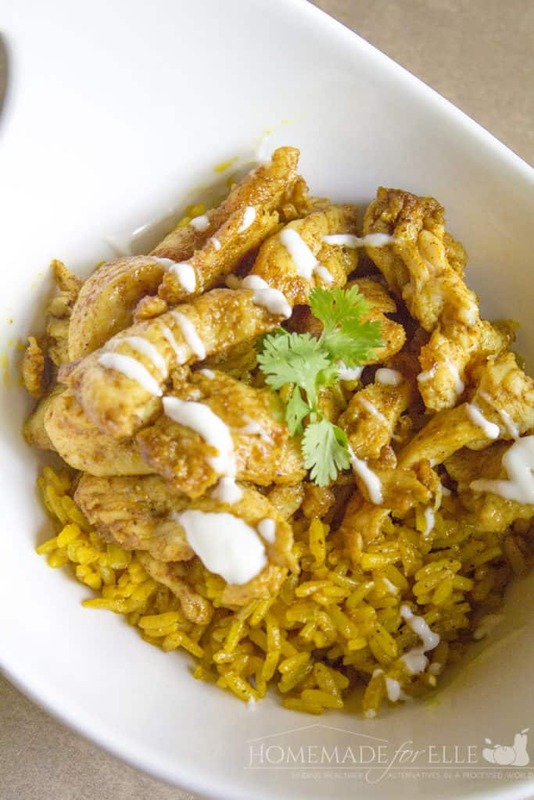 I dished up the turmeric rice with chicken shawarma on top, and dinner was ready! I love this recipe because it introduces new flavors to my family, and it’s really easy to make for busy school nights. As an added bonus, my kids LOVED it! Slice chicken breasts into thin pieces. Combine remaining ingredients in a bowl, mix, and pour over chicken. Marinate for 30 minutes to an hour. Once marinated, warm a skillet over medium heat, and add in chicken. Cook for 3 - 5 minute a side, until cooked through and no longer pink in the middle. Bring chicken broth (or water) to a boil and add in rice. Boil until tender. In another pot, melt butter over medium heat and add in cooked rice. Season with turmeric, salt and pepper, and saute for 3 - 5 minutes. I pick up my family’s groceries and essentials at Walmart, where I find great deals in one convenient location. 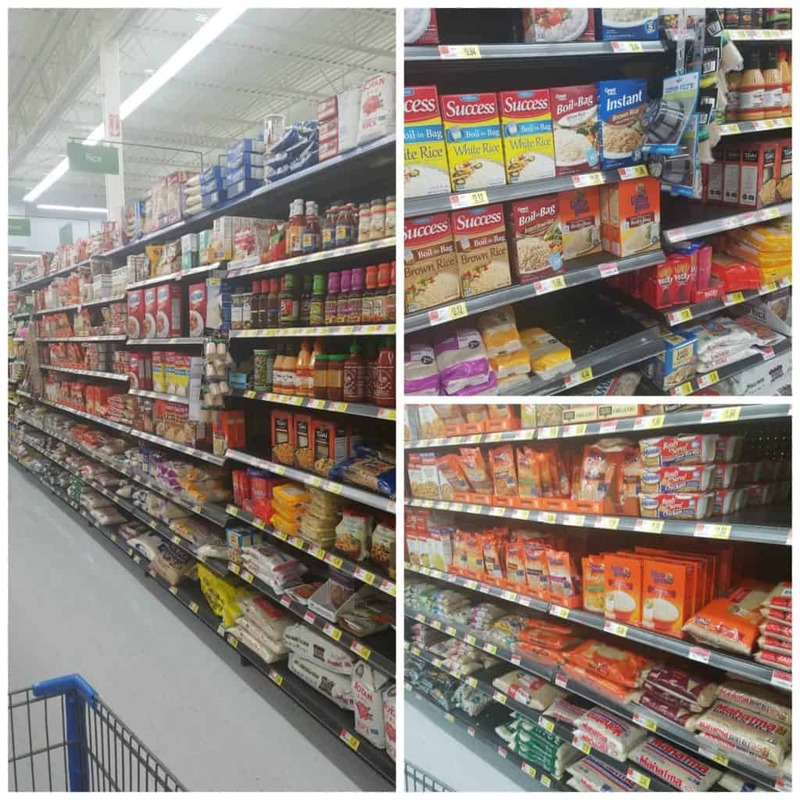 I also snagged an Ibotta coupon offer for $.75 off Ready Rice products, exclusively at Walmart. 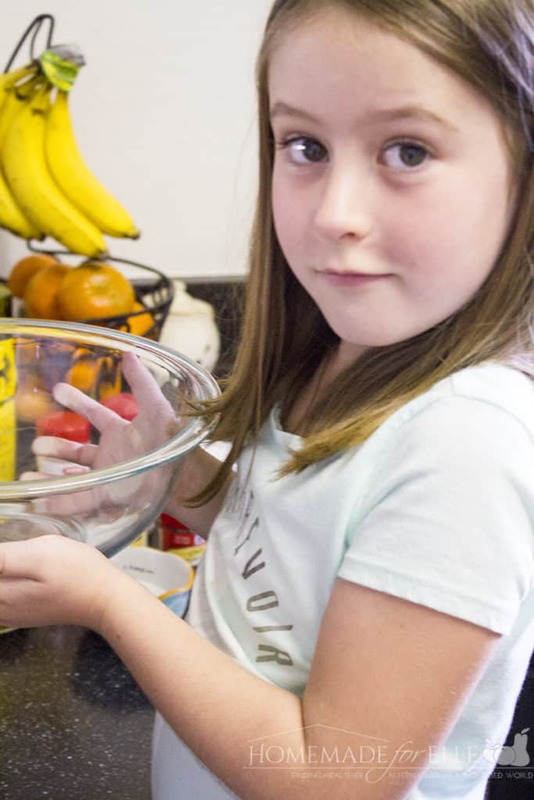 Ben’s Beginners has the ambition to get kids to cook! They are hosting an AMAZING giveaway and you have a chance to win! 5 lucky families will win $15,000 for themselves and $30,000 cafeteria makeover for their kid’s school. Enter that amazing giveaway here! You can also enter below for a Walmart giftcard – good luck! Be sure to drop by Uncle Ben’s for your free $.75 coupon! What is the white sauce drizzled in your photo? Wow u made chicken shawarma how did it turn out? How fortunate your daughter is that your daughter is learning how to cook delicious meals at a young age. I remember liking mac n’ cheese from a box as a kid until that day that I saw the neon orange powdered cheese. Yikes! I’ve never eaten it again since then. I’m looking forward to trying your recipe this week.